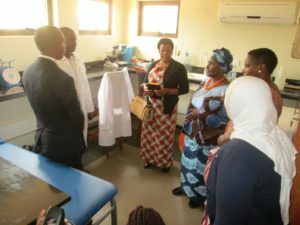 The Minister for Trade and Industry Amelia Kyambadde, is optimistic trade between Uganda and Rwanda will improve, thanks to the implementation of a Memorandum of Understanding (MoU) reached between the two countries on the elimination of Non-Trade Barriers (NTBs). 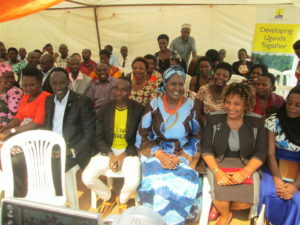 Ms Kyambadde was speaking at the launch of the Mirama hills Cross-border trade charter on Thursday. She said the opening of the One Stop Border Post at Mirama hills border with Rwanda is a major step towards the elimination of non-trade barriers. Ms Kyambadde interacts with locals. Ms Kyambadde cited the construction of a One Stop border post, 24/7 border operations as well as harmonised immigration procedures and weighbridge operations among the initiatives that have been implemented. She said Uganda had in 2012 signed a MoU on elimination of NTBs, promotion of cross-border trade, cooperatives development and development of small and medium enterprises with Rwanda to strengthen bilateral relations. She, however, said there is need to strengthen women, youth and small scale cross-border traders and further reduce delays by attracting more institutions to the One stop border post as Rwanda in currently doing. 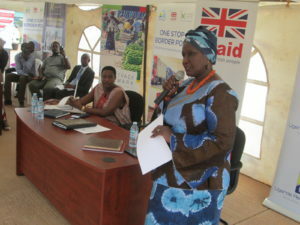 Ms Kyambadde speaking during the launch of the Mirama hills One Stop border post. According to Ms Kyambadde, there are fewer imports into the country, an issue that is threatening the bilateral trade between the two countries. “In 2014, Uganda’s exports to Rwanda were worth $24.5m and in 2015 they reduced to $23.7m. During the same period, Uganda imported goods worth $10.8 million in 2014 and $9.3 million in 2015. We need to put more effort in attaining Balance of Trade,” she said. The Mirama hills One Stop border post was constructed with funding from the Trade Mark East Africa (TMEA). The TMEA country director, Mr Moses Sabiti, said some traders, especially small scale cross-border traders, were still using illegal routes to trade for fear of taxation due to ignorance of the taxes because the Uganda Revenue Authority has not taken the initiative to engage communities in tax education. 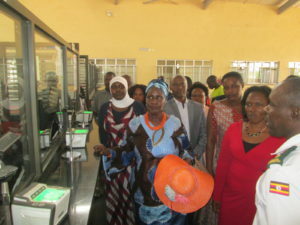 Minister Amelia Kyambadde touring the Mirama hills One Stop border facility. He asked the minister to intensify publicity for the Mirama hills One Stop border so that more traffic pass through the border post as an alternative route to Katuna which has been over congested. Ms Kyamabadde also admitted that with traffic flow diverted through Mirama hills which is even a shorter route to Kigali, it will consequently decongest Katuna and lead to the development of communities around the border post. She also revealed that 18 border markets will be constructed including one at Mirama hills.